The current generation Maserati Quattroporte was released in 2013. Just three years later and Maserati has decided to give the car a refresh. Like the Ghibli, there are plenty of things not to like about the Quattroporte, but this 2017 refresh might solve a few of them. The exterior features very minor changes, including new bumpers with an electronically adjustable air shutter in the front grille. 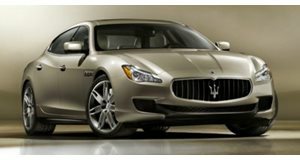 This gives the Quattroporte better control over the engine's fluid temperatures. The interior is where the 2017 Quattroporte really improves.